Tracy's Notebook of Style: Old Navy + H&M Deals (plus FREE Shipping) under $20 + Huge Sales! 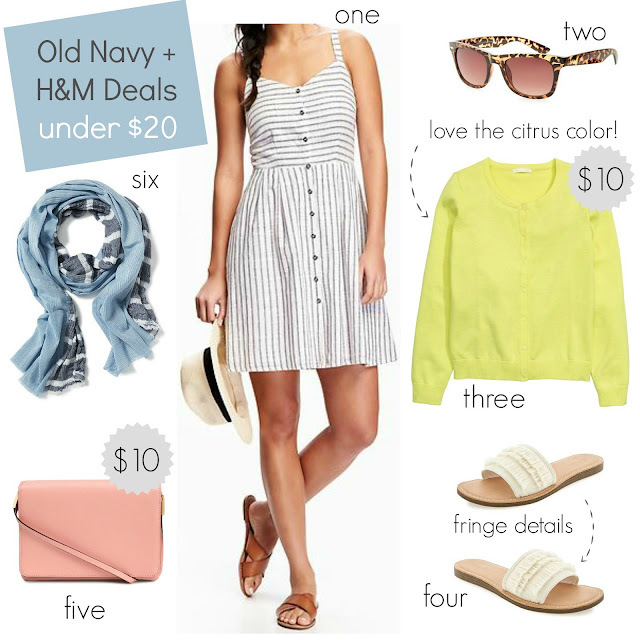 Old Navy + H&M Deals (plus FREE Shipping) under $20 + Huge Sales! Happy hump day fashionistas! I was surprised to find so many good sales to shop today and the cutest statement tees that speak to me...loudly. Old Navy is having a big dress sale in time for Easter, which is the place I purchased my last three holiday dresses! Sorry I have been such a bad blogger and not been posting here on a more regular basis, I just haven't have the time (I seriously don't know how everyone else does it, especially those with kids, my fashion hats off to you!). I still want to share all the best deals and try to post on Instagram and Facebook when I can, thank you for following along! Are you excited to start shopping for spring? I love their dresses, while I didn't try it on at the store, I will say the length is longer, it does not look this short in person, obviously it depends on your height, but it's not short I promise! 2 ON Sunnies $9 ($12) Super excited that their sunglasses are now online, my store always have pairs I would buy if there weren't a billion fingerprints on them, haha. I have a few of these cardigans, I grab one when I head to the movies or dinner and toss it over my bag, they are a perfect "just in case" sweater and this color is always a favorite of mine for spring. 4 ON Fringe Sandals $16.50 ($22.94) These are adorable and very on trend, between Target and Old Navy, I''ll be all set with my spring shoes! This bag was really cute in person (especially for only $10! ), I use a bag I don't want to worry about (but still want to look nice) when I go places like the dentist, get my hair colored, basically my appointments so I don't ruin any of my favorites with flying toothpaste or hair color, LOL and I'll probably be ordering this one since my Payless bag I used is well over 10 years old! 6 ON Scarf $10.50 ($16.94) I probably have way too many ON scarves, but I can't help myself since I love how many colors and styles they stock each season and you can't beat adding a ten dollar item to update your spring wardrobe! Shop the JCP tees below: On sale $15.99 ($36) after the extra 20% off! order your regular size and it will be a perfect fit! Cute stuff! Love those Old Navy dresses!